Fax important documents. Place a call. Copy a report. Now, one machine can simplify your everyday office tasks. Its Automatic Document Feeder holds up to 20 letter-sized pages, and it's capable of transmitting one page in approx. 6 seconds"reducing your wait time and your phone bill. If you're out of paper or your line is busy, it can hold up to 60 pages1 in fax memory. Its inkjet print engine produces bold, clear text and graphics, and Ultra-High Quality (UHQ) image processing helps to make your faxes clean and crisp.. 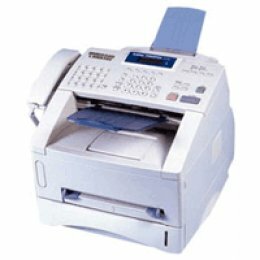 High-end faxing: Fax at up to 14.4 Kbps, store phone numbers to 69 speed-dial locations, and receive up to 60 incoming pages1 into memory. lean and clear: Ultra-High Quality (UHQ) image processing technology allows you to fax photos, fine text, even illustrations while maintaining exceptional clarity.